Why? Because Shun has also become synonymous with "quality". All three of the major US cutlery retailers -- Williams Sonoma, Sur La Table and Crate and Barrel -- have pushed out high-end German knives to make room for them. Throw in endorsements from Bobby Flay, Alton Brown and Sarah Moulton and you know they must be something special. And special they are. The blades are made from razor-sharp VG-10 steel, found only in high-end Japanese knives. They are wrapped on each side by sixteen layers of high-carbon stainless steel. This produces a beautiful Damascus-style blade that features sharpness, edge retention and stain-resistance. The Rockwell Hardness rating of these knives is 61 -- one of the highest values you'll find in a kitchen knife. This allows the blade to be among the sharpest kitchen blades available on the market. The handles are black pakkawood, a resin-infused hardwood that, coupled with the handle's D-shape, provides a non-slip grip. Add in the standard "lightweight" Japanese feel and you have knives that won't produce fatigue. Shun's seven piece set includes all of our recommended "essential" blades: an 8" inch chef's knife, a 9" serrated slicing/bread knife, a 3.5" paring knife and a 6" utility knife. 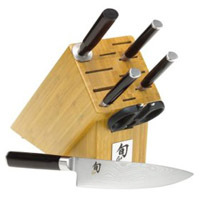 It adds a sharpening steel for honing your edges, kitchen shears and an bamboo block with 11 horizontal slots. Since these knives are so good looking, you might want to consider getting a magnetic strip to display them instead of the block. The six-piece set is the same as the seven, minus the bread knife. It's also $100 cheaper. The eight-piece set is the same as the seven, but adds another, smaller chef's knife. It's also $100 more expensive. The seven-piece set seems to be the sweet spot, but your needs and budget may say otherwise.